When a country wins World's Leading Culinary Destination you take notice. When Peru won World's Leading Culinary Destination four years in a row from 2012 through 2015, you know it's definitely time to visit. When a country wins World's Leading Culinary Destination you take notice. When Peru won World's Leading Culinary Destination four years in a row from 2012 through 2015, you know it's definitely time to visit. While the focus is on the food and gastronomy, we put a spotlight here on the 10 unique drinks you must try in Peru. Pisco Sour is considered the national drink of Peru and it even has its own national holiday. National Pisco Sour Day is celebrated on the first Saturday in February. Pisco Sour is made with Peruvian Pisco as the base liquor and the addition of lime juice, syrup, ice, egg white, and Angostura bitters.The fine balance between the intense citrus lime juice and sweetness of the sugar syrup makes it very easy to drink. Like the Pisco Sour, the Chilcano also uses Pisco as the base liquor. The classic Chilcano is made of Pisco with lime juice, ginger ale, ice and Angostura bitters. Variations can be made with exotic fruit juices like maracuya (passion fruit) or lucuma. While the Chilcano may not be as popular as the Pisco Sour, it is a refreshing and lighter alternative. The Chilcano also has its own week long festival that takes place in mid-January. 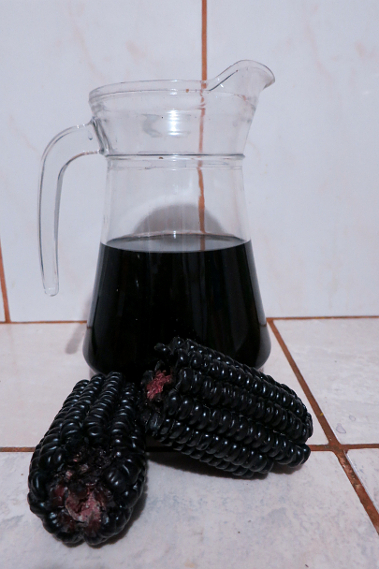 Chicha Morada is a unique drink that is made with purple corn (Maiz morado in Spanish). Purple corn is native to Peru and has a long history that dates back prior to the Inca Empire. Purple corn has many health benefits including reduced risk of heart disease and lower blood pressure. This non alcoholic drink is made by boiling the purple corn with pineapple skin, cinnamon, cloves, and sugar. Deliciously sweet and with an intriguing deep purple color, you must indulge in the goodness contained in this unique drink. 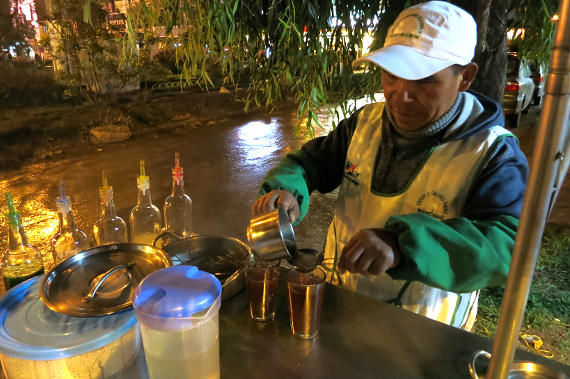 Chicha de jora is a traditional drink from the Andes that comes from the Inca times. It is beer made of Jora corn, a type of yellow corn from the Andes. You will find this beer in small Andean villages in the Sacred Valley. One unique characteristic of this beer is its thick foam. It is tradition to spill the first portion of the beer on the ground saying "Pachamama, Santa Tierra" as an offering to Earth Mother (Pachamama in Quechua). A very intriguing beverage, Chicha de Jora starts with slightly sweet taste and finishes with a sour taste similar to a bitter apple cider. Chicha de Frutilla, also known as Frutillada, is a sweeter version of Chicha de Jora. 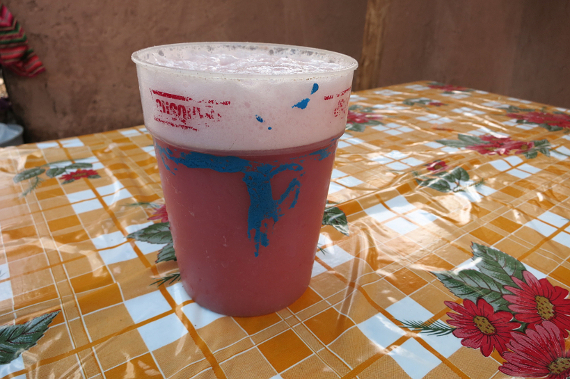 It is made with strawberries (frutilla) and sugar blended with the Chicha de Jora. 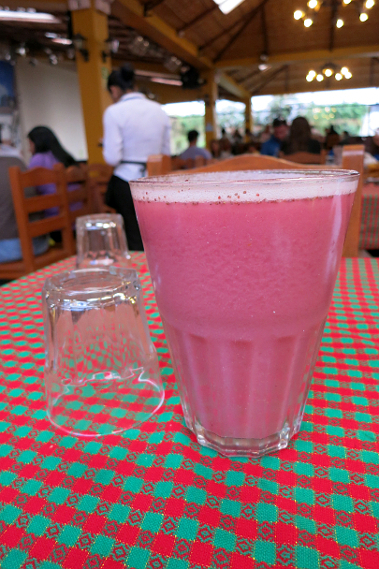 It has a strange pink color and the strawberries cover up the sour taste of Chicha de Jora. 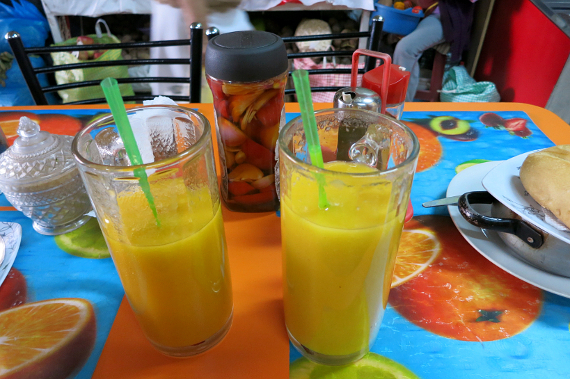 You can find Frutillada in traditional or local restaurants in the Andes. 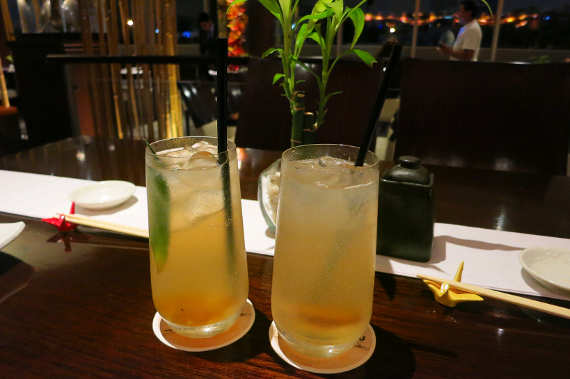 Served in enormous glasses, you will need both hands to hold the glass. 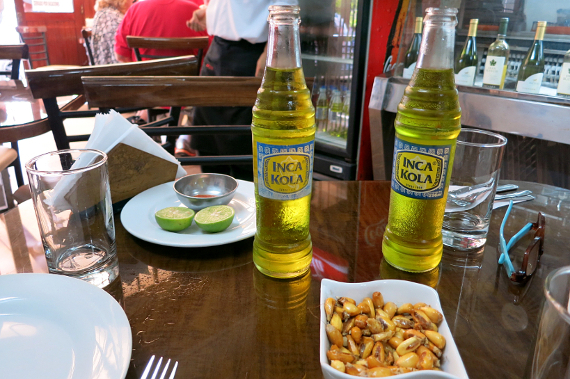 Inca Kola is the most popular soft drink in Peru. It is a yellow fluorescent colored soda that is super sweet and tastes like bubble gum. 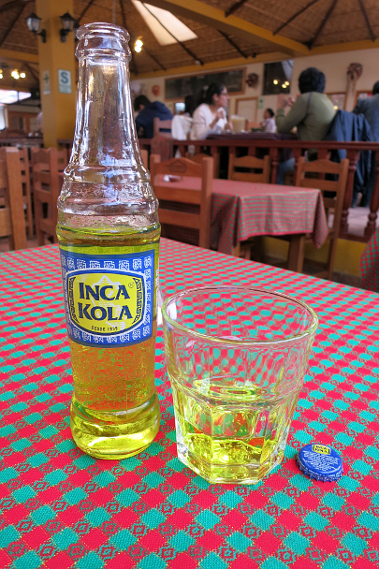 The origins of Inca Kola go back to 1910 when a young English couple José and Martha Lindley opened a shop in Lima, where they sold homemade carbonated beverages. In 1935, Lima was celebrating 400 years since its founding and the Lindleys decided to produce a unique drink to commemorate the event. Inca Kola was born. Marketed as the "Pride of Peru" this drink is everywhere. It is the preferred drink to complement many Peruvian dishes. 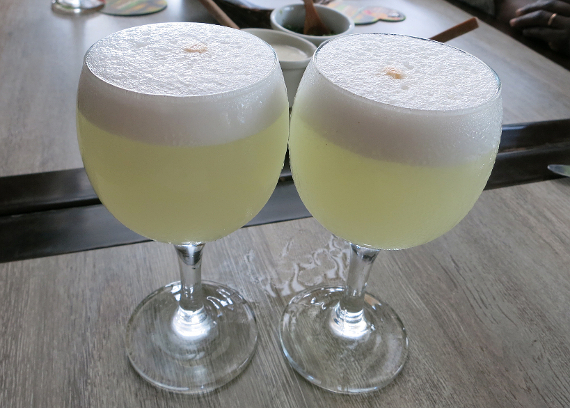 Although Pisco Sour is Peru's national drink, beer is the most popularly consumed alcoholic beverage. Peru has three major beer brands Pilsen Callao, Cristal and Cusqueña. Pilsen Callao and Cristal are both lagers with mild flavor. 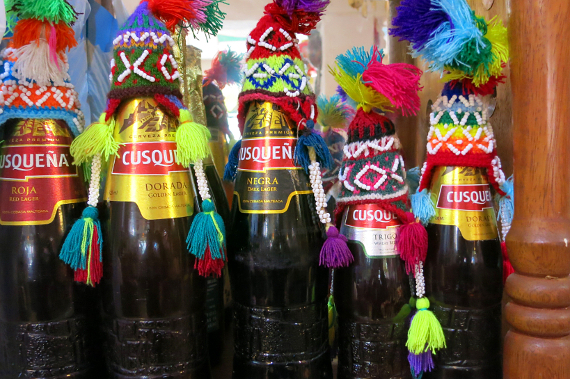 Cusqueña makes several variations: golden lager, red lager, wheat beer, and dark lager. Definitively a favorite, there is a beer for every taste. Famous in the Andes region, this unique drink is an herbal tea made from the leaves of a coca plant. Mate de Coca is used to treat altitude sickness. On your way to Machu Picchu, this tea will help you adapt to the high altitude. However, this tea is controversial. The leaves contain alkaloids, which when extracted chemically are the source for cocaine. 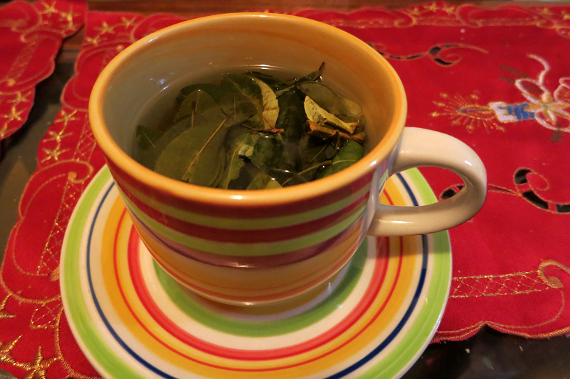 Though the amount of coca alkaloids in the leaves is small, one cup of coca tea can cause a positive result on a cocaine drug test. Controversy aside, it is easy to drink and has a green tea taste. Emoliente is one of the most unique drinks you will find. Sold at street corners by vendors, it is popular in the cold season. Emoliente is believed to have healing and medicinal properties.The base is a mix of herbs that usually includes barley, dried horsetail, flax seed, plantain leaf and alfalfa sprouts. Bottles on the cart contain liquids made from natural plants from the Andes mountains. The taste is a little bizarre. Imagine drinking a hot, fruity, slimy and semi-sparkly beverage. However, if you are not feeling well and looking for a natural remedy, give this drink a try. 10. Peruvian Juices and "Jugo Especial"
Peru is a fruit lover's paradise. One of the best ways to enjoy the fruits is in fresh juices. You will find juice stands everywhere and most restaurants and cafes offer fresh juices on their menus. The fruit choices are endless and include bananas, papayas, pineapples, guavas, maracuya (passion fruit) and more. The secret Peruvian juice speciality is the "Jugo Especial". It is a mix of several fruits, one egg and Cusqueña beer (optional). This deliciously thick juice is like a meal and big enough to share. Did any of these drinks leave you thirsty? Share which ones in the comments below.